"Port Huron" redirects here. 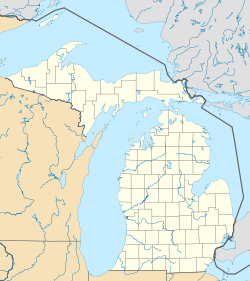 For other uses, see Port Huron (disambiguation). This area was long occupied by the Ojibwa people. French colonists had a temporary trading post and fort at this site in the 17th century. In 1814 following the War of 1812, the United States established Fort Gratiot at the base of Lake Huron. A community developed around it. The early 19th century was the first time a settlement developed with a permanent European-American population. Until 1836, an Ojibwa reservation occupied land in part of the modern area of Port Huron. They were removed by the United States to west of the Mississippi River in Wisconsin and Minnesota. In 1857, Port Huron became incorporated. Its population grew rapidly after the 1850s due a high rate of immigration attracted by the successful shipbuilding and lumber industries. In 1859 the city had a total of 4,031 residents; 1855 were of foreign birth or their children. By 1870, Port Huron's population exceeded that of surrounding villages. In 1871, the State Supreme Court designated Port Huron as the county seat. On October 8, 1871, the city, as well as places north in Sanilac and Huron counties, burned in the Port Huron Fire of 1871. A series of other fires leveled Holland and Manistee, Michigan, as well as Peshtigo, Wisconsin and Chicago on the same day. The Thumb Fire that occurred a decade later, also engulfed Port Huron. In 1895 the village of Fort Gratiot, in the vicinity of the former Fort Gratiot, was annexed by the city of Port Huron. The following historic sites have been recognized by the State of Michigan through its historic marker program. Fort St. Joseph. The fort was built in 1686 by the French explorer Duluth. This fort was the second European settlement in lower Michigan. This post guarded the upper end of the St. Clair River, the vital waterway joining Lake Erie and Lake Huron. Intended by the French to bar English traders from the upper lakes, the fort in 1687 was the base of a garrison of French and Indians. In 1688 the French abandoned this fort. The site was incorporated into Fort Gratiot in 1814. A park has been established at the former site of the fort. Fort Gratiot Light. The Fort Gratiot Lighthouse was built in 1829 to replace a tower destroyed by a storm. In the 1860s workers extended the tower to its present height of 84 feet (26 m). The light, automated in 1933, continues to guide shipping on Lake Huron into the narrow and swift-flowing St. Clair River. It was the first lighthouse established in the State of Michigan. Lightship Huron. From 1935 until 1970, the Huron was stationed in southern Lake Huron to mark dangerous shoals. After 1940 the Huron was the only lightship operating on the Great Lakes. Retired from Coast Guard Service in 1970, she was presented to the City of Port Huron in 1971. Grand Trunk Railway Depot. The depot, which is now part of the Port Huron Museum, is where 12-year-old Thomas Edison departed daily on the Port Huron – Detroit run. In 1859, the railroad's first year of operation, Edison convinced the railroad company to let him sell newspapers and confections on the daily trips. He became so successful that he soon placed two newsboys on other Grand Trunks running to Detroit. He made enough money to support himself and to buy chemicals and other experimental materials. Port Huron Public Library. In 1902 the city of Port Huron secured money from philanthropist Andrew Carnegie to erect a municipal library. In 1904, a grand Beaux-Arts-style structure was built at a cost of $45,000. At its dedication, Melvil Dewey, creator of a widely used book classification system, delivered the opening address. The Port Huron Public Library served in its original capacity for over sixty years. In 1967, a larger public library was constructed. The following year the former library was renovated and re-opened as the Port Huron Museum of Arts and History. An addition was constructed in 1988. Harrington Hotel. The Hotel opened in 1896 and is a blend of Romanesque, Classical and Queen Anne architecture. The hotel closed in 1986, but a group of investors bought the structure that same year to convert it into housing for senior citizens. The Harrington Hotel is listed on the National Register of Historic Places. Grand Trunk Western Railroad Tunnel. The tunnel was opened in 1891 and links Port Huron with Canada. This international submarine railway tunnel was the first international tunnel in the world. The tunnel's total length is 6,025 feet (1,836 m), with 2,290 feet (700 m) underwater. The tunnel operations were electrified in 1908; half a century later they were converted to use diesel fuel. Tracks were lowered in 1949 to accommodate larger freight cars. During World War I, a plot to blast the tunnel was foiled. A new tunnel has since been opened. The city received the All-America City Award in 1955 and 2005. Port Huron is the only site in Michigan where a lynching occurred. The event is now memorialized. According to the United States Census Bureau, the city has a total area of 12.26 square miles (31.75 km2), of which 8.08 square miles (20.93 km2) is land and 4.18 square miles (10.83 km2) is water. The city is considered to be part of the Thumb area of East-Central Michigan, also called the Blue Water Area. The easternmost point (on land) of Michigan can be found in Port Huron, near the site of the Municipal Office Center and the wastewater treatment plant. The Black River divides the city in half, snaking through Port Huron and emptying into the St. Clair River near Downtown. As of the census of 2010, there were 30,184 people, 12,177 households, and 7,311 families residing in the city. The population density was 3,735.6 inhabitants per square mile (1,442.3/km2). There were 13,871 housing units at an average density of 1,716.7 per square mile (662.8/km2). The racial makeup of the city was 84.0% White, 9.1% African American, 0.7% Native American, 0.6% Asian, 1.2% from other races, and 4.5% from two or more races. Hispanic or Latino of any race were 5.4% of the population. There were 12,177 households of which 32.5% had children under the age of 18 living with them, 34.5% were married couples living together, 19.9% had a female householder with no husband present, 5.6% had a male householder with no wife present, and 40.0% were non-families. 33.0% of all households were made up of individuals and 11.8% had someone living alone who was 65 years of age or older. The average household size was 2.42 and the average family size was 3.03. The median age in the city was 35.8 years. 25.6% of residents were under the age of 18; 9.9% were between the ages of 18 and 24; 26.3% were from 25 to 44; 25.2% were from 45 to 64; and 13.1% were 65 years of age or older. The gender makeup of the city was 47.8% male and 52.2% female. The Great Lakes Maritime Center offers opportunities to learn about the history of the Great Lakes. Freighters pass within 100 feet (30 m) of the glass windows, and there is an underwater live camera feed. The School for Strings presents over 50 concerts each year with its Fiddle Club, Faculty, and Student Ensembles. It provides music education across the area. Each year, the Port Huron to Mackinac Boat Race is held, with a starting point in Port Huron north of the Blue Water Bridge. The race finishes at Mackinac Island, Michigan, crossing Lake Huron. It is considered by some boaters to be a companion to the longer Chicago Yacht Club Race to Mackinac. The Port Huron Civic Theatre began in 1956 by a group of theater lovers. Since 1983, it has used McMorran Place for its productions. The Blue Water Film Festival is held in the fall, which has had notables such as Chris Gore, Sid Haig, Curtis Armstrong, Timothy Busfield, Loni Love, Dave Coulier, and more. The main branch of the St. Clair County Library is located in downtown Port Huron. The library contains more than 285,300 books, nearly 200 magazine subscriptions, and over 22,700 books on tape, books on compact disc, music compact discs, cassettes, and videos. The International Symphony Orchestra of Sarnia, Ontario and Port Huron, Michigan perform events at McMorran Place and the Imperial Oil Centre for the Performing Arts in Sarnia. Encompassing over 100 homes and buildings, the Olde Town Historic District is Port Huron's first and only residential historic district. The Olde Town Historic Neighborhood Association is an organization working to preserve historic architecture in Port Huron. They have hosted an annual historic home tour, flower plantings and beautification and neighborhood Christmas decorations. The Welkin Base Ball Club is Port Huron's historic vintage base ball team. Modeled on Port Huron's first baseball club from 1867, the Welkin Base Ball Club re-creates the time of baseball's roots. In 2009 the TV show Criminal Minds used Port Huron, and Detroit as locations for an episode involving crossing the border into Ontario. Port Huron has had a strong tradition of minor league hockey for many years. The Port Huron Flags played in the original International Hockey League from 1962-1981, winning three Turner Cup championships in 1966, 1971 and 1972. Its leading career scorers were Ken Gribbons, who played most of his career in the IHL; Bob McCammon, a lifelong IHLer who went on to be a National Hockey League coach with the Philadelphia Flyers and the Vancouver Canucks; Bill LeCaine and Larry Gould, who played a handful of NHL games with the Pittsburgh Penguins and the Vancouver Canucks, respectively. Legendary NHL hockey broadcaster Mike Emrick started his career doing play-by-play hockey for the Flags on AM 1450 WHLS in the mid 1970s. Emrick would go on to broadcast Olympic hockey games and Stanley Cup playoffs for NBC Sports, and is a frequent guest contributor to sister station WPHM. Port Huron was also represented in the Colonial Hockey League (also operating under the names United Hockey League and International Hockey League), with franchises from 1996 until the league folded in 2010. Originally called the Border Cats, the team was renamed the Beacons in 2002, the Flags in 2005 and the Icehawks in 2007. Among the more notable players were Bob McKillop, Jason Firth, Tab Lardner and Brent Gretzky. The Port Huron Fighting Falcons of the junior North American Hockey League played at McMorran Place, beginning in 2010 until 2013. The team moved to Connellsville, PA for the 2014 season. The team's name was changed to the Keystone Ice Miners. Port Huron is also home to the Port Huron Prowlers of the Federal Hockey League. The Port Huron Pirates indoor football team dominated the Great Lakes Indoor Football League up until their departure to Flint, MI. McMorran Arena once again hosted indoor football with the Port Huron Predators of the Continental Indoor Football League in 2011. The Predators failed to finish the 2011 season, and were replaced in 2012 by the Port Huron Patriots who also participated in the CIFL. The City of Port Huron owns and operates 17 waterfront areas containing 102 acres (0.4 km2) and 3.5 miles (5.6 km) of water frontage. This includes three public beaches and six parks with picnic facilities. The city also has nine scenic turnout sites containing over 250 parking spaces. Port Huron operates the largest municipal marina system in the state and has five separate locations for boat mooring. The City has 14 public parks, 4 smaller-sized “tot” parks, 19 playgrounds (City owned), 9 playgrounds (School owned), 33 tennis courts, including 16 at schools and 6 indoors, 3 public beaches, 4 public swimming pools, 1 community center, and 1 public parkway. Federally, Port Huron is part of Michigan's 10th congressional district, represented by Republican Paul Mitchell, elected in 2016. A variety of factories related to the Automotive Industry occupy Port Huron's Industrial Park on the city's south side. Many of these produce plastic components for vehicles. Port Huron is served by two acute care facilities, McLaren Port Huron (formerly known as Port Huron Hospital), and Lake Huron Medical Center. McLaren Health Care Corporation, a nonprofit managed care health care organization based in Flint, Michigan, purchased the former Port Huron Hospital and began operating the 186-bed facility as Mclaren Port Huron in May 2014. Lake Huron Medical Center, is a 144-bed facility operated by Ontario, California based Prime Healthcare Services. The for-profit company purchased the former St. Joseph Mercy Port Huron hospital in September 2015 from Trinity Healthcare. Upon completion of the sale, the formerly non-profit Catholic institution converted to a for-profit entity. Port Huron's longtime financial institution was Citizens Federal Bank. The financial institution's headquarters was located in Port Huron with branches throughout the Thumb. The bank's name was changed to Citizens First in 1997 . In early 2010, Citizens First was closed by the Michigan Office of Financial and Insurance Regulation. It the first bank in Michigan to fall victim of the financial crisis. The assets of Citizens First were acquired by First Michigan bank of Troy. First Michigan would be renamed Talmer Bancorp before being purchased by Chemical Financial Corporation in 2016. The first station to sign on in Port Huron was WHLS, coinciding with the opening of the Blue Water Bridge in 1938. It was founded by Harold Leroy Stevens and Fred Knorr. John Wismer became part owner of the station in 1952. He would later launch the first Cable Television system in Port Huron and WSAQ in 1983. Wismer died in 1999. The Times Herald launched its own radio station in 1947 known as WTTH. That station would later become WPHM, and was bought by Lee Hanson in 1986. WPHM got FM sister station WBTI in 1992. Wismer and Hanson were direct competitors until they were both bought by Bob Liggett's Radio First in 2000. Radio First owns and operates five radio stations in the region while Port Huron Family Radio is the licensee of sole station WGRT. Non-commercial stations include St. Clair County Regional Education Service Agency's WRSX, high school station WORW, and religious broadcasters WNFA and WNFR. The following is a list of broadcast radio stations that provide local content to the Port Huron Area. Other stations may be heard area over the air however their content is not directed to residents of the city. The Times Herald , a daily local newspaper serving St Clair County and Sanilac counties. It is owned by Gannett, which also owns the Detroit Free Press and USA Today. Two Interstates terminate at the Port Huron-to-Sarnia Blue Water Bridge, and they meet Highway 402. I-94 enters the Port Huron area from the southwest, having traversed the entire Metro Detroit region, and, along with I-69, terminates at the approach to the Blue Water Bridge in Port Huron. On the Canadian side of the border, in Sarnia, Ontario, the route heads easterly designated as Highway 402. M-25 follows the Lake Huron/Saginaw Bay shoreline, beginning in Bay City and ending in at junction with I-94/I-69, and BL I-94/BL I-69 on the north side of the city. M-29 begins at BL I-94 in Marysville just south of the city and continues southerly. M-136 runs west from M-25 to M-19. The Blue Water Area Transit system, created in 1976, includes eight routes in the Port Huron area. Blue Water Transit operates the Blue Water Trolley, which provides a one-hour tour of various local points of interest. Recently, Blue Water Area Transit received a grant from the state to buy new buses for a route between the Port Huron hub and New Baltimore about 30 miles (48 km) south. Commuters could take an express bus traveling down I-94 and get off at the 23 Mile Road SMART Bus stop. At the same time, another bus will travel down M-25 and M-29 and pick up commuters in Marysville, Saint Clair and Algonac before ending up at the same stop on 23 Mile Road. This new system will help people in St. Clair County travel through Metro Detroit. Amtrak provides intercity passenger rail service on the Blue Water route from Chicago to Port Huron (Amtrak station). Two class one freight railroads operate in Port Huron – Canadian National Railway (CN) and CSX Transportation (CSXT) with international connections via the St. Clair Tunnel. Via Rail train service from Toronto to Sarnia (part of the Quebec City – Windsor Corridor) is also available; however, this train does not cross the river, requiring passengers to make arrangements for road travel to Port Huron. St. Clair County International Airport is a public airport located five miles (8 km) southwest of the central business district. Sarnia Chris Hadfield Airport, located across the St. Clair River in Sarnia, Ontario, offers daily service to Toronto's Lester B. Pearson International Airport operated by Air Georgian, a regional affiliate of Air Canada. ^ a b "American FactFinder". United States Census Bureau. Archived from the original on 2012-02-17. Retrieved 2012-11-25. ^ "History of St. Clair County - Port Huron Township & City". ancestry.com. Archived from the original on 2009-11-11. Retrieved 2009-11-10. ^ Shepard, Liz (April 30, 2018). "Port Huron's past included on lynching memorial". Port Huron Times Herald. Retrieved March 18, 2018. ^ "NOWData - NOAA Online Weather Data". National Oceanic and Atmospheric Administration. Archived from the original on 2014-01-29. Retrieved February 18, 2013. ^ "Port Huron Museum". Port Huron Museum. Archived from the original on 2005-08-24. Retrieved 2005-12-01. ^ "The Dude, The Port Huron Statement, and The Seattle Seven". mentalfloss.com. 10 January 2011. Archived from the original on 2018-06-15. Retrieved 2018-06-15. ^ "To Hell... And Back". 20 May 2009. Archived from the original on 2018-03-27. Retrieved 18 March 2018 – via www.imdb.com. ^ "dira - Entries tagged with criminal minds". dira.dreamwidth.org. Archived from the original on 2018-03-19. Retrieved 18 March 2018. ^ "Radio man gives back to the community". thetimesherald.com. Retrieved 18 March 2018. ^ Gibbons, Lauren (August 16, 2017). "Michigan State University, city of East Lansing at odds over proposed income tax". MLive Lansing. Mlive Media Group. Archived from the original on 2017-08-16. Retrieved August 16, 2017. ^ "Grain Elevator at Port Huron, St. Clair River". www.dia.org. ^ "Memory of roasting chicory lingers". The Times Herald. ^ "Port Huron once dominated chicory trade". The Times Herald. ^ "Mueller Co. Locations – Mueller Museum". Archived from the original on 2018-06-15. Retrieved 2018-06-15. ^ "Mueller Industries - Aluminum forging and brass and lead - free brass forging - Markets Served - Forgings". muellerindustriesipd.com. Archived from the original on 2018-06-15. Retrieved 2018-06-15. ^ T. J. Gaffney (2006). Port Huron, 1880-1960. Arcadia Publishing. pp. 50–. ISBN 978-0-7385-4119-8. ^ "Dunn Paper - Dunn to Perfection". Archived from the original on 2018-06-15. Retrieved 2018-06-15. ^ "Port Huron Mill - Domtar". www.domtar.com. Archived from the original on 2018-06-15. Retrieved 2018-06-15. ^ "Port Huron Hospital becomes McLaren's 12th hospital". crainsdetroit.com. 1 May 2014. Archived from the original on 2018-03-19. Retrieved 18 March 2018. ^ "Public forum set on sale of St. Joseph Mercy Port Huron to for-profit chain". crainsdetroit.com. 31 March 2015. Archived from the original on 2015-09-28. Retrieved 18 March 2018. ^ "InstitutionHistory". www.ffiec.gov. Archived from the original on 2018-06-24. Retrieved 2018-06-24. ^ "Feds close Citizens First Bank". Huron Daily Tribune. 4 May 2010. Archived from the original on 2018-06-24. Retrieved 2018-06-24. ^ "Blue Water Area Transit". bwbus.com. Archived from the original on 2006-12-06. Retrieved 2006-12-14.